Keep your private conversations private! 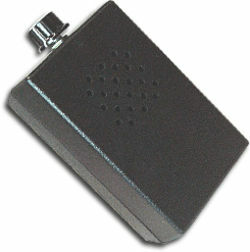 The PORTABLE PRIVACY AUDIO JAMMER protects your sensitive room conversations by generating a random masking sound which desensitizes any near-by microphone. Effective against any microphone based eavesdropping device including tape recorders, RF transmitters, hard-wired microphones (including contact type) and shotgun microphones. It also protects against microwave or laser reflection pickups. Because the sound from the jammer varies randomly in frequency and amplitude, it cannot be easily filtered and the only sound the eavesdropper will hear is the jammer noise. The convenient end-mounted control lets you select the level of protection for your situation. One unit will protect up to 150 sq. ft. For protecting rooms larger than this, we recommend and additional jammer for each 150 sq. ft. of area. The illustrated instructions show suggested jammer placement for different types of rooms and situations so that you can use the AJ-34 effectively. Measures 4" x 2.5" x 1.5"